Who is the Ideal First-Round Opponent for the Dallas Stars? As the Dallas Stars continue to march towards the postseason, it is time to look at potential first-round match-ups and what the ideal option is for Dallas. They’ve played the Central Division incredibly well this year, posting an overall record of 15-7-3 so far. Although they have just 11 games left in the regular season, their potential match-ups are still great in number. Realistically, they could play the St. Louis Blues, Chicago Blackhawks, Nashville Predators, Colorado Avalanche or the Minnesota Wild. Barring a really bad few weeks, they are not likely to face a Pacific division opponent in the first-round. Five realistic opponents. If you’re the Dallas Stars, who would you want to face? Let’s break it down. 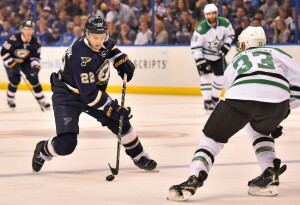 Although the Blues can say they walked away with four victories in five chances against the Stars, all of the games were tightly fought. The Stars lost twice in overtime and once in a shootout. The other two games the two teams split 3-0 victories over each other. One thing about these games is they all were incredibly physical, something the Stars struggle with from time-to-time. They have a couple of guys like Jamie Benn and Antoine Roussel who like to throw the body around, but overall they are one of the smaller teams in the NHL. One weakness that has been exposed at times this season has been the defensemen and their inability to truly deal with a physical forecheck. It has caused some rushed decisions with the puck that tend to lead to turnovers and goals against. The Blues throw out an incredibly physical lineup that goes after defensemen hard. The Stars have the speed to skate around the Blues at times, but this is probably the worst possible match-up for Dallas. The Stars have had one special teams stinker against the Blackhawks this season and other than that, they have controlled the reigning Stanley Cup champions so far this year. They have wins of 5-2, 4-0 and 4-2 on the season and have continuously pelted Hawks’ goaltender Corey Crawford with rubber. Crawford is in the Vezina conversation and, if it wasn’t for the Stars this season, he might be running away with that award. On the season series, the teams have been split in terms of their possession numbers. In the first two contests, Dallas held a CorsiFor advantage of 102-67 during 5-on-5 play. The most recent two games, Chicago had the advantage by a score of 86-69. Overall, Dallas has the edge, but it is close. This match-up is actually one of the better ones if you simply look at how the two teams have played this season. Obviously the Blackhawks in the playoffs are a completely different animal, so that is something to consider. However, the Stars line up excellently against them. Like the Stars, the Blackhawks have given up a lot of quality chances at even strength this season. The Hawks have given up 642 high-danger-scoring-chances this season while the Stars have given up 695. The difference is how many they produce. The Stars have 735 high-danger-scoring-chances this season during 5-on-5 play, best in the NHL. The Blackhawks have significantly less with 591. The Stars are able to expose Chicago’s lack of defensive depth and their aggressive style frequently. This would surprisingly be one of the best possible match-ups for Dallas. Fun fact, all three of the game-winning goals scored so far in this season series have been scored by players named Mattias. Mattias Janmark for the Stars has two of them while Mattias Ekholm has the one a few weeks ago for Nashville. This would be a classic “strength versus strength” match-up. Nashville allows the fewest high-danger-chances-against in the NHL while Dallas produces the most. With the addition of Ryan Johansen, the Predators pose more of an offensive threat than perhaps ever before. As for the season series, it has been almost even possession-wise. Neither team has had an outstanding advantage over the other in the three contests so far. On the scoreboard, there has been essentially two blowouts and a game decided in overtime, so it’s tough to separate these two teams on paper. I’ll give the Predators a slight advantage because I believe they can out-chance the Stars over a seven-game series with their defense locking the Stars down and their offense getting enough done. This series would likely go six or seven. This match-up is absolutely baffling. 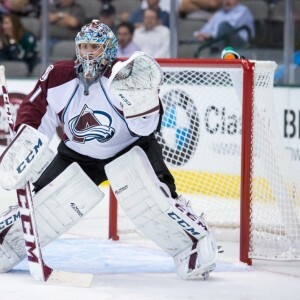 The Dallas Stars simply have an enormously difficult time beating the Colorado Avalanche. It is pretty inexplicable. The Stars have dominated the season series on the possession-meter. Here are the CorsiFor advantages at even-strength in the three games so far this season against the Avs: 68-26 (3-2 OT win), 73-28 (3-1 loss) and 53-42 (6-3 loss). Much like he does against the Blackhawks, Semyon Varlamov consistently finds a way to frustrate and dominate the Dallas Stars. The Stars will throw every scoring chance possible at him and he seems to repel them with relative ease. On the surface, you’d look at this match-up and say the Stars would take this series in four or five games. That simply wouldn’t be the case as the Avs just seem to have the Stars’ number. The Stars would also likely be without their leading scorer in the season series, Jason Demers. On paper, I love this match-up for the Dallas Stars. However, my heart says no. Who knows how this one would go. At last we arrive to the Stars ideal first-round match-up, the Minnesota Wild. Although the season series has consisted of three overtime wins for the Dallas Stars, they have controlled the play for the most part against Minnesota. Add in the fact that the Wild are having all sorts of problems right now, if they manage to limp into the postseason it doesn’t feel as though they would pose much of a threat to any team in the Western Conference. Dallas is just a match-up nightmare for the Wild this season. They are no longer getting game-stealing-goaltending from Devan Dubnyk and that would be the only realistic shot at beating the Stars in a seven game series. They don’t produce enough chances to keep up with the Stars at even strength. They are solid at limiting quality chances as only seven teams in the NHL have given up fewer high-danger-chances so far this season. Unfortunately for Minnesota, Dallas produces those at a rate that is really tough to limit. The Wild don’t have the talent down the middle match-up with Tyler Seguin, Jason Spezza and Cody Eakin. Their best chance against Dallas will be Dubnyk stealing the series. This is easily the most ideal match-up for the Dallas Stars this coming postseason.